I dedicate this to Winston Ruiters, a carpenter I met yesterday. We spoke about God, cave paintings, my African ancestors and some other things. Whilst thinking of Winston early this morning, I was reminded of another carpenter. This man loved God more than any other human ever had. 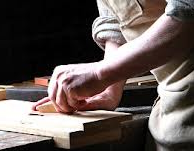 Yet he chose a carpentry shop instead of a religious seminary to prepare himself for God’s work. This man had greater abilities to build a religious empire than all the world’s televangelists put together, yet he never took up an offering. This man had greater stature than the Pope, yet he hated organised religion. This man could assemble a crowd in seconds, yet he avoided them. This man had more wisdom and knowledge than one can find in all the world’s libraries, yet he had no title or credentials. This man could actually do the miracles that faith healers can only dream of, yet he rebuked those who wanted him to hold a miracle crusade. This man had the ability to bring God into politics, yet he took Him out of it. This man managed to attract the attention of the rich and famous, yet he chose to befriend the poor. This man had the ability to save his life, yet he gave it as a ransom for many. So I ask you, how can any human being not love this man?